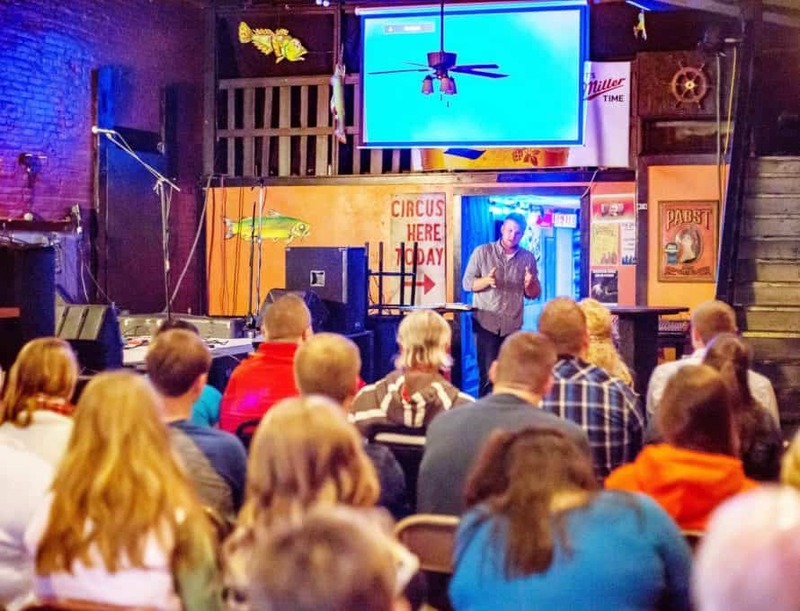 WARRENSBURG – Atticus Dyer never wanted to plant a church. When he felt called to vocational ministry at the age of 17 during a revival, he envisioned being a pastor, but church planting was not a part of that picture. After completing college and seminary at Midwestern in 2013, he reconnected with John Cox, lead pastor of Concordia Baptist and his former high school football coach. Cox shared with him a vision for rural church planting. God began to stir in Dyer a heart to plant a church. That heart was born largely out of what he witnessed in the leaders of Concordia Baptist. Their gospel community officially became Pillar Church in April of 2016. Dyer was joined by Ryan Shippy and Seth Petsch to form a three-man pastor/elder team. They chose to meet on Sunday evenings in unconventional locations, such as the former bar building they are now seeking to purchase, in hopes of drawing those who might reject a more traditional service time and location, such as college students. “We’re not here only for the university, but we can’t skip over it either,” Dyer says. God opened a second unexpected pathway of ministry for Dyer shortly after the church plant launched. Brad Carr, the former BSU director at UCM, invited Pillar to provide meals at the BSU. “The BSU was a foreign concept,” Dyer says, “because I’d gone to Midwestern.” But what he saw energized him. “Their mission was to send students out from the BSU to the ends of the earth, and I loved that.” When Carr approached him about taking over as director of the BSU, it seemed an unexpected but obvious answer to Pillar’s intention for him to be bivocational. Almost three years into the church plant, Dyer is realistic yet hopeful about the challenges – and the potential – of church planting and campus ministry. “We’re seeing lives changed, but it’s not on the massive levels we would love to see,” he says. Still, he’s excited by what has transpired, particularly the stories of those who have taken the gospel out from Warrensburg to other places – such as a young woman who returned to Wales with her newfound faith after graduating from UCM, or a young man from Mexico City and his wife, both of whom were baptized at Pillar and are now part of a church plant in Mexico City.